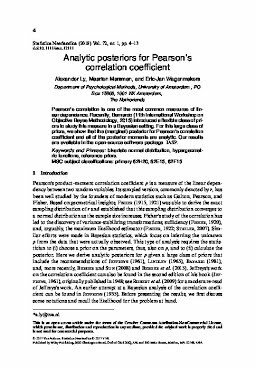 Centrum Wiskunde & Informatica: Analytic posteriors for Pearson's correlation coefficient. Analytic posteriors for Pearson's correlation coefficient. Pearson’s correlation is one of the most common measures of linear dependence. Recently, Bernardo (11th International Workshop on Objective Bayes Methodology, 2015) introduced a flexible class of priors to study this measure in a Bayesian setting. For this large class of priors, we show that the (marginal) posterior for Pearson’s correlation coefficient and all of the posterior moments are analytic. Our results are available in the open-source software package JASP.